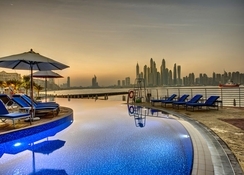 Situated on Dubai’s iconic Palm Jumeirah, the 5-star resort of Dukes The Palm, a Royal Hideaway Hotel beautifully melds British hospitality with cosmopolitan luxury. 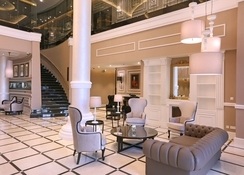 Inspired by sister hotel Dukes London, in Mayfair, this award-winning property brings guests unmatched levels of service, luxury amenities and a scenic beachfront location in the heart of Dubai. 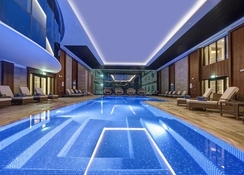 The hotel boasts first-class facilities, with a gorgeous infinity pool and access to the twinkling beach, the fun-loving Dukesy Kids' Club, plus a Health Club on the 14th floor featuring a state-of-the-art gym and relaxing yoga classes with views of Dubai Marina skyline. The Dreamworks Spa is always a popular go-to for guests who like to stay pampered. Dukes The Palm, a Royal Hideaway Hotel rooms and apartments offer ultimate comfort and quality, with all the amenities you'd expect from a prestigious hotel and the views to match. Wine, dine and relax at the hotel's six spectacular bars and lounges, bringing the best of local and International cuisine, elegant high tea and refreshing cocktails. Outside of the resorts, the guests will be met by a hive of activity with nearby Dubai Marina – dotted with boutique shops, restaurants and bars – Mall of the Emirates and the new centrepiece, the Nakheel Mall. 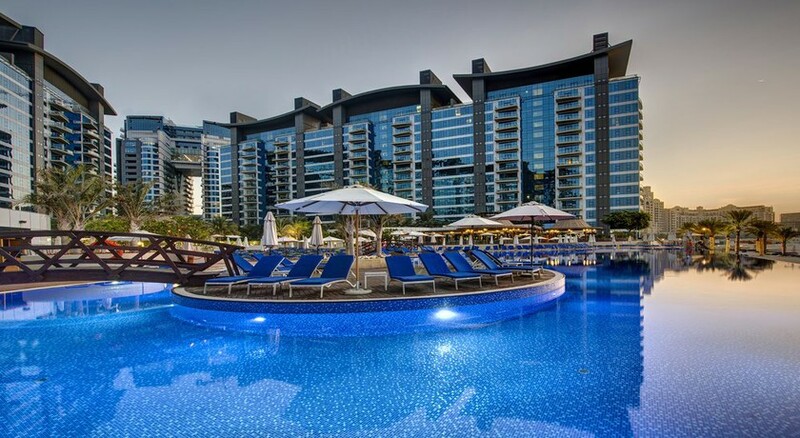 Soak up the sun on the man-made beach or indulge in a spot of retail therapy at the buzzing Nakheel Mall - Dukes The Palm, a Royal Hideaway Hotel is located close to most of Dubai's attractions and well-connected via public transport. Ski Dubai and Mall of Emirates are a 10-minute drive away. Equally, the Dubai Marina houses bustling cafés, trendy boutiques, and sizzling nightspots. The Medina and Internet City are few km away. 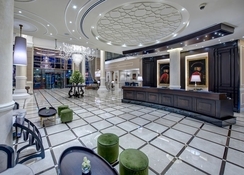 The hotel is 27km away from Dubai International Airport. 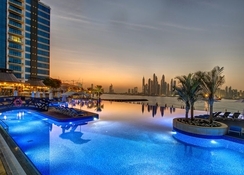 Dukes The Palm, a Royal Hideaway Hotel boasts 279 tastefully appointed rooms, including 64 stately suites and 287 opulent studios and One-Bedroom Apartments - all offering magnificent views of the Gulf, Dubai Marina and Palm Jumeirah. The elegantly furnished rooms come with either Twin or King Beds, Floris toiletries, flat satellite TV, coffee/tea maker, wardrobe, safe deposit box, and free WIFI. Cribs are also available on request. Serving up authentic Brit cuisine is the Great British Restaurant (GBR), an all-day fine dining restaurant providing dishes served with a British twist. This brasserie style ambience welcomes guests with elegant, double height ceilings and large life-size windows, offering amazing sea views. Other restaurants available at Dukes The Palm, a Royal Hideaway Hotel include West 14th, Khyber, The DUKES Bar, The Champagne and Tea Lounge and The Cigar and Whisky Lounge. Guests can relax with pamper-worthy massages and treatments at the hotel's Dreamworks Spa. The options available include Balinese full body massage, four hands, warm stone and a selection of rejuvenating facials - or head to the Toni & Guy hair salon. Fitness enthusiasts can head to the scenic Health Club with a choice of gym equipment and yoga classes to enjoy. The younger guests can chill in the lazy river or the children’s pool, or head to the Dukesy Kids’ Club for exciting games and activities. With so many activities, there’s something for all in the family at this hotel. Free! WiFi is available in all areas and is free of charge. Free! Free private parking is possible on site (reservation is needed).